November 2017 warmest November on record	No ratings yet. November 2017 was the third warmest November in 137 years of modern record-keeping, according to a monthly analysis of global temperatures by scientists at NASA’s Goddard Institute for Space Studies (GISS) in New York. Last month was +0.87 degrees Celsius warmer than the mean November temperature from 1951-1980, an insignificant 0.03°C cooler than November 2016 (+0.90°C). 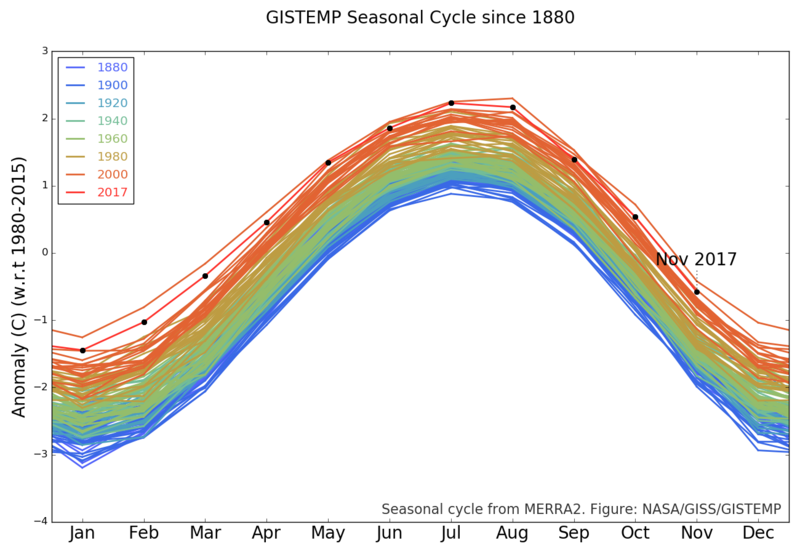 The warmest month of November according to the analysis happened in 2015 (+1.03°C) due to a strong El Niño. The last three Novembers — 2015, 2016, and 2017 — are the three warmest in the entire modern record. The past meteorological year (December 2016 through November 2017) is the second warmest such period, only surpassed by the El Niño enhanced December 2015 through November 2016 period.